Up to 10 military aircraft, four civil aircraft and 13 ships will assist in today's search for missing Malaysia Airlines flight MH370. Aircraft and ships reported spotting a large number of objects during yesterday's search, but only a small number were able to be recovered. None of the recovered items were believed to be associated with MH370. Today AMSA has planned a search area of about 57,923 square kilometres. The centre of the search area lies approximately 2280 kilometres north west of Perth. Moderate south easterly winds with isolated showers are forecast. Visibility will be fair (5000 metres) during the showers. The Australian Transport Safety Bureau continues to refine the area where the aircraft entered the water based on continuing ground-breaking and multi-disciplinary technical analysis of satellite communication and aircraft performance, passed from the international air crash investigative team comprising analysts from Malaysia, the United States, the United Kingdom, China and Australia. SYDNEY—The search zone for Malaysia Airlines 3786.KU +2.38% Flight 370 continued to narrow Thursday, as authorities focused on picking up fading signals that may be from the missing jet's "black boxes" before their batteries run out of power. 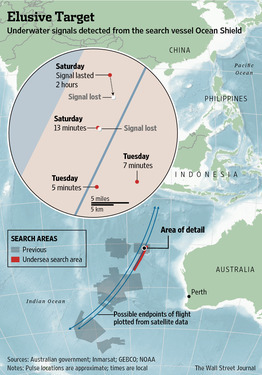 The Australian authority leading the multinational hunt said as many as 14 planes and 13 ships would patrol an area of about 57,923 square kilometers (22,364 square miles) of the southern Indian Ocean northwest of Perth—the narrowest zone yet in a close to five-week-old search for the jet, which disappeared en route to Beijing from Kuala Lumpur on March 8. On Wednesday, Australia sent a P-3 Orion military aircraft to drop 84 sonar buoys in a remote patch of the southern Indian Ocean, broadly in the same spot where the Australian defense vessel Ocean Shield detected the stream of signals. Each sonar buoy is equipped with a set of underwater microphones that unspool on wires to a depth of 1,000 feet. The buoys send data through a radio system back to the aircraft for analysis—a technique typically used to track enemy submarines attempting to evade surface radar. Dropped in a pattern across the search area, the buoys could help to triangulate the source or sources of four signals picked up by the Australian navy since April 5. Ocean Shield has been sweeping a 7-mile strip of water since Friday. It is towing a U.S. Navy device nearly 2 miles beneath the ocean surface, listening for sounds from the black boxes. Other vessels, including the Chinese ship Haixun 01, are also doing an underwater search of an area farther south, though they haven't detected any new signals since late last week. The Chief Coordinator of the Joint Agency Coordination Centre, Air Chief Marshal Angus Houston (Ret'd), has confirmed that whilst conducting an acoustic search this afternoon a RAAF AP-3C Orion aircraft has detected a possible signal in the vicinity of the Australian Defence Vessel Ocean Shield. “The acoustic data will require further analysis overnight but shows potential of being from a man-made source,” Air Chief Marshal Houston (Ret'd) said. PERTH, Australia -- An Australian aircraft hunting for the missing Malaysian jet picked up a new possible underwater signal on Thursday in the same area search crews detected sounds earlier in the week that were consistent with an aircraft's black boxes. The Australian navy P-3 Orion, which has been dropping sound-locating buoys into the water near where the original sounds were heard, picked up a "possible signal" that may be from a man-made source, said Angus Houston, who is coordinating the search off Australia's west coast. "The acoustic data will require further analysis overnight," Houston said in a statement. If confirmed, this would be the fifth underwater signal picked up in the hunt for Flight 370, which vanished over a month ago on a flight from Kuala Lumpur, Malaysia, to Beijing. Malaysia Airlines Flight 370 disappeared from military radar for about 120 nautical miles after it crossed back over the Malaysian peninsula, sources say. Based on available data, this means the plane must have dipped in altitude to between 4,000 and 5,000 feet, a senior Malaysian government official and a source involved in the investigation tell CNN. Fishermen Plane Sighting a Tip or False Lead in MH370 Hunt? Azid Ibrahim, Rahim Mamat and six other men left Kota Bharu in northern Malaysia for tuna fishing that night and were 10 miles out at sea between Malaysia and Vietnam, an area that would have been in the plane's initial flight path. Suddenly a plane came thundering overhead, louder and lower than Ibrahim had ever seen. The plane was heading west, Ibrahim said. Mamat agrees with what they saw. The fishing boat returned to Kota Bharu in the morning and when they heard about the plane's disappearance they reported what they saw to the local police. Residents of a remote atoll in the Indian Ocean claim to have seen a "low flying jumbo jet" on the morning after Malaysia Airlines Flight 370 vanished, according to a report in the Maldives paper Haveeru Daily. Maldives, a collection of coral atolls and islets, has a population of some 400,000 islanders. Haveeru Daily is the country's longest serving daily newspaper. Several Maldives residents on the island of Kuda Huvadhoo told Haveeru that they saw a large white aircraft, with red stripes across it (like Malaysia Airlines planes) around 6:15 a.m. local time (9:15 a.m. Malaysia time) on March 8. The Island Councilor of Kuda Huvadhoo told Haveeru that several of the islanders had spoken about the incident. A local aviation expert told Haveeru that the possibility of any aircraft flying over the island at the reported time is extremely low. If true, the sighting would upend the leading theories about where Boeing 777 went after making a hard turn west into the Strait of Malaka at about 1:30 a.m. Malaysia time. Sighting by witnesses? None of them have been substantiated. I haven't come across later articles to contradict this conclusion. DEVELOPING: Did They See Flight 370? (CNN) -- How could a commercial airliner disappear without a sign, you ask? In fact, several people on the ground or at sea claimed they saw Malaysia Airlines Flight 370 before it went missing after its post-midnight takeoff from Kuala Lumpur on March 8. The purported eyewitnesses include fishermen, an oil rig worker and islanders in an atoll. Some even alleged they saw it crash. While none of their claims have been substantiated, their assertions add to the ongoing mystery of the missing Boeing 777 and the 239 people aboard. Malaysia Airlines Flight 370 disappeared from military radar for about 120 nautical miles after it crossed back over the Malay Peninsula, sources say. Based on available data, this means the plane must have dipped in altitude to between 4,000 and 5,000 feet, a senior Malaysian government official and a source involved in the investigation tell CNN. The sources also told CNN that Malaysian air force search aircraft were scrambled about 8 a.m. March 8 to the South China Sea and the Strait of Malacca, soon after Malaysia Airlines reported that its plane was missing. The aircraft took off before authorities corroborated data indicating that the plane turned back westward, a senior Malaysian government official told CNN. But the air force did not inform the Department of Civil Aviation or search and rescue operations until three days later, March 11, a source involved in the investigation told CNN. Later Thursday, communications officials from Malaysia's Transportation Ministry denied that jets had scrambled shortly after the plane went missing, calling that claim a "false allegation." Up to 12 military aircraft, three civil aircraft and 13 ships will assist in today's search for missing Malaysia Airlines flight MH370. Today the Australian Maritime Safety Authority has planned two search areas in close proximity totalling about 46,713 square kilometres. The centre of the search areas lies approximately 2312 kilometres north west of Perth. The weather forecast for today is 10–15 knot southerly winds with isolated showers, seas swells of 1 to 1.5 metres and visibility of five kilometres in showers. Yesterday there were no sightings reported by search aircraft or objects recovered by ships. The Chief Coordinator of the Joint Agency Coordination Centre, Air Chief Marshal Angus Houston (Ret'd), said an initial assessment of the possible signal detected by a RAAF AP-3C Orion aircraft yesterday afternoon has been determined as not related to an aircraft underwater locator beacon. “The Australian Joint Acoustic Analysis Centre has analysed the acoustic data and confirmed that the signal reported in the vicinity of the Australian Defence Vessel Ocean Shield is unlikely to be related to the aircraft black boxes,” Air Chief Marshal Angus Houston (Ret'd), said. “Further analysis continues to be undertaken by Australian Joint Acoustic Analysis Centre. “Today Ocean Shield is continuing more focussed sweeps with the Towed Pinger Locator to try and locate further signals that may be related to the aircraft's black boxes. It is vital to glean as much information as possible while the batteries on the underwater locator beacons may still be active. “The AP-3C Orions continue their acoustic search, working in conjunction with Ocean Shield, with three more missions planned for today. “A decision as to when to deploy the Autonomous Underwater Vehicle will be made on advice from experts on board the Ocean Shield and could be some days away. Up to nine military aircraft, one civil aircraft and 14 ships will assist in today's search for missing Malaysia Airlines flight MH370. Today, Australian Defence Vessel Ocean Shield continues more focused sweeps with the Towed Pinger Locator to try and locate further signals related to the aircraft's black boxes. The AP-3C Orions continue their acoustic search, working in conjunction with Ocean Shield. The oceanographic ship HMS Echo is also working in the area with Ocean Shield. This work continues in an effort to narrow the underwater search area for when the Autonomous Underwater Vehicle is deployed. There have been no confirmed acoustic detections over the past 24 hours. Aircraft and ships reported spotting a number of objects during yesterday's search, but only a small number were able to be recovered. None of the recovered items were confirmed to be associated with MH370. (CNN) -- The U.S. Navy commander leading the American effort to find Malaysia Airlines Flight 370 said he's "optimistic" about how the search is proceeding. "We are detecting very continuous pings coming through in a manner consistent with exactly what you'd expect from a black box," Cmdr. William Marks told CNN's Erin Burnett on Friday. "We've ruled out that it was anything natural, or anything from commercial shipping, or anything like that." Families of the 239 people who were aboard when the plane disappeared from radar screens early March 8 met Friday with Malaysia Airlines and government officials. They came away unpersuaded that progress was being made. "Today, all they said was that they were confident," family representative Steve Wang said. "But that really doesn't mean that they have confirmed it. They didn't use the word 'confirm.' So it could be that it's a real lead, but it could also not be. I think that, at the moment, everyone needs to wait for final, confirmed information." Plane search "likely to continue for a long time to come"
PERTH, Australia -- With no new underwater signals detected, Australian Prime Minister Tony Abbott said Saturday that the massive search for the missing Malaysian jet would likely continue "for a long time," with electronic transmissions from the plane's black boxes fading fast. Abbott continued to express his belief Saturday, but added that the job of finding the plane, which disappeared March 8 en route from Kuala Lumpur, Malaysia, to Beijing, remained arduous. Recovering the plane's flight data and cockpit voice recorders is essential for investigators to try to piece together what happened to Flight 370. "No one should underestimate the difficulties of the task still ahead of us," he said on the last day of his China trip. We have "very considerably narrowed down the search area, but trying to locate anything 2.8 miles beneath the surface of the ocean about 620 miles from land is a massive, massive task, and it is likely to continue for a long time to come," Abbott said. "Given that the signal from the black box is rapidly fading, what we are now doing is trying to get as many detections as we can," Abbott said. "So that we can narrow the search area down to as small an area as possible." The underwater search zone is currently a 500-square-mile patch of the seabed, about the size of Los Angeles. 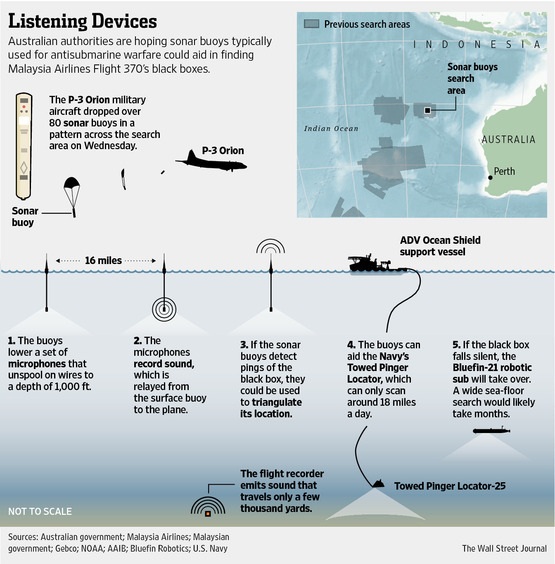 The searchers want to pinpoint the exact location of the source of the sounds - or as close as they can get - and then send down a robotic submersible to look for wreckage. But the sub will not be deployed until officials are confident that no other electronic signals are present. The Bluefin 21 submersible takes six times longer to cover the same area as the ping locator. That's about six weeks to two months to canvass the current underwater zone. The signals are also coming from 15,000 feet below the surface, which is the deepest the Bluefin can dive. The search coordination center has said it was considering options in case a deeper-diving sub is needed. The surface area to be searched for floating debris has been narrowed to 15,982 square miles of ocean extending from about 1,400 miles northwest of Perth. Up to 10 planes and 14 ships were searching Saturday. The co-pilot of the missing Malaysia Airlines flight may have made a "desperate" cell-phone call before the plane fell off the radar, according to a published report. The New Straits Times, a newspaper with close ties to the Malaysian government, did not divulge the details of the call. But it was an intriguing development in the more than month-long mystery behind the disappearance of flight MH370. The report claims that Fariq Abdul Hamid may have turned his cell phone on as the doomed Boeing 777 flew low over the Malaysian city of Penang. His phone reportedly connected with a telecommunications tower in the city before the connection was cut off—so if he made a call, it never went through. "The telco's [telecommunications company's] tower established the call that he was trying to make. On why the call was cut off, it was likely because the aircraft was fast moving away from the tower and had not come under the coverage of the next one," an unidentified source told NST. "If Fariq could make one call before the plane disappeared, it would have been to [his mother],” said 18-year-old cousin Nursyafiqah Kamarudin. Officials in Malaysia are still conducting investigations into the backgrounds of the 12 crew members who were on board. "This is usually the result of the phone being switched off. At one point, however, when the airplane was airborne, between waypoint Igari and the spot near Penang (just before it went missing from radar), the line was 'reattached,’” sources told NST. The New Straits Times quoted acting Transport Minister Hishammuddin Hussein as saying that the report needed to be verified.